Despite the important role parents play as high school students search about for the right college to attend, few colleges and universities have created communication programs that recognize that importance. 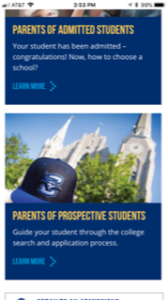 Creighton University website content is different. Parents who follow the link of most interest will find content created for easy scanning and reading. Google Test My Site gives a 7 second “Fair” rating for mobile download speed, estimating a 26 percent visitor loss. Join 656 people on the Top Tasks: Higher Education Website Content group on LinkedIn. Next:College Presidents & US News Rankings… What do they say on Twitter?